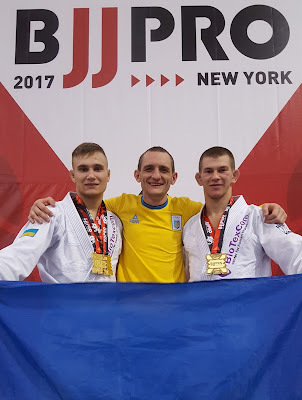 The prestigious international “New York IBJJF Pro” championship was held in New York, USA recently. The most competitive fighters of Brazilian jiu-jitsu have shown their great technical skills at this championship. Ukrainian fighters of SC “Borets” / ZR Team Kropivnitskiy Yaroslav Blazhko and Roman Nepota were also among participants. Ukrainians have impressed both referees and audience by their high technique. Multiple champions Roman Nepota and Yaroslav Blazhko have shown once again they are rather strong fighters and can confidently compete with world sportsmen. Roman Nepota became the winner of the “New York IBJJF Pro” both in his weight category and in the absolute category among the blue belts. The athlete held 4 fights and all of them he won by technical superiority. In the final of the absolute category Nepota competed with the Brazilian sportsman. The fight was ended with an excellent choke by the Ukrainian fighter. Yaroslav Blazhko also took gold at the championship. Blazhko held 4 successful fights and in all of them he received confident victory by points. Moreover, the Ukrainian fighter also competed in the absolute category with the Brazilian fighter Wilson Moreira (IBJJF 2017 World Heavyweight Champion). The opponent was very strong, both physically and technically, but Yaroslav shown a great result even though he lost this fight. According to the coach of the SC “Borets” / ZR Team, Ievgen Skyrda, the level of development and popularity of Brazilian jiu-jitsu in America is extremely high. A great number of prestigious championships are held here. And the strongest world sportsmen gather in America to compete for the gold medals. Ukrainian athletes will return to America in March 2018 to take part in the “Pan Jiu-Jitsu IBJJF Championship”.